Hedy Epstein (née Wachenheimer) was born August 15, 1924 in Freiburg, Germany. She lived with her parents Ella and Hugo Wachenheimer in Kippenheim, Germany. Her family had lived in Germany for many generations. Both sides of the family originally came from Spain. Hedy's father operated a dry-goods business with his brother. The business had been started by his grandfather Heinrich Wachenheimer in 1858. Hedy's mother was a housewife. Hedy was their only child. Hedy was 8 years old when Adolf Hitler came to power in Germany on January 30, 1933. She remembers her parents and other adults talking about Hitler, saying that they hoped he would not gain power in Germany, and then, after he did, hoping that he would not remain in office very long. After that January day, things began to get slowly worse for Jews and other minorities in Germany. A boycott of Jewish businesses. Anti-semitism in schools. Revocation of German citizenship for all Jews. Kristallnacht, known today as Reichsprogromnacht in Germany. Burning of synagogues. Jewish males over the age of 16 placed into "Schutzhaft," or "protective custody," in concentration camps throughout Germany. Finally, all Jews deported into labor or concentration camps. The death of 6 million Jews and 5 million others in those camps. On May 18, 1939, Hedy went to England on a children's transport. Five hundred children were on this transport, part of the almost 10,000 children that England took in between December 1938 and September 1, 1939, the beginning of World War II. Hedy's parents had tried for many years to leave Germany as a family, but were unsuccessful, due to emigration restrictions in various countries around the world. Finally, after consulting with the 14-year-old Hedy, her parents found a way out for her on the children's transport. Hedy never saw her family again. Hedy's parents and other family members were deported on October 22, 1940 to Camp de Gurs, a concentration camp in what was then Vichy France. France at that time was occupied by the Nazis. Men and women were separated by barbed wire. Living conditions were horrendous. Hedy, however, did not learn of this until after the war. Due to an aberration of the war, inmates of the camp in Gurs could correspond with the outside world. Each person was allowed to write one page each week. Hedy's parents sent her letters for the next two years, but they were careful not to mention the atrocious living conditions they had to endure. They wanted to protect their daughter. In the spring of 1941, Hedy's father was sent to another camp in France, Camp les Milles. In July 1942 Hedy's mother was sent to Camp de Rivesaltes. Between August and September 1942, Hedy's parents and all other surviving family members were sent to the concentration camp Auschwitz. Inmates were not allowed to correspond with the outside world. None was ever heard from again. The last communication Hedy ever received from her mother was a postcard dated September 4, 1942. The postcard said, "Traveling to the east ... Sending you a final goodbye." Hedy spent the rest of World War II in England. 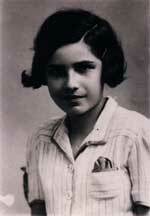 She went to school and then went to work in a variety of jobs, including a factory producing war materials. Once the war was over, Hedy went back to Germany to work for the American government. First she was with the US Civil Censorship Division, and later she worked at the Nuremberg Medical Trial, which tried the doctors accused of performing medical experiments on concentration camp inmates. Part of her reason for returning to Germany was to find her family, but she was unsuccessful. Hedy came to the United States in May 1948. Her only living relatives were an uncle and an aunt who had emigrated to the US in early 1938. Once here, she worked in a variety of jobs. Although she did not realize it at the time, many of those jobs were part of her quest to find her parents and her family. Soon, Hedy became active professionally and personally in the causes of civil and human rights and social justice. Some of her causes have included fair housing, abortion rights, and antiwar activities. As a peace delegate, Hedy journeyed to Guatemala, Nicaragua, and Cambodia in 1989. Hedy visited the Israeli Occupied West Bank five times since 2003, to witness the facts on the ground. She participated in several non-violent demonstrations, together with Israelis, Palestinians & other internationals, in opposition to Israel's occupation of Palestinian land, the 25-foot high cement wall, and the demolition of Palestinian homes and olive orchards. Hedy began speaking to audiences in 1970. Her topics include her Nazi Holocaust experiences, her work at the Nuremberg Medical Trial, and her five trips to Palestine since 2003. Equally conversant in English and German, she has spoken in the US, Germany, and Austria to audiences of schoolchildren, college students, and adults. In addition, she has appeared on several radio and television shows as a guest. She is a member of the Speakers Bureau of the St. Louis Holocaust Museum and Learning Center. In addition to speaking locally, nationally, and internationally, Hedy has appeared on local, national, and international radio and TV programs as a guest. She has written many articles on social issues which have been published in local, national & international newspapers and journals. In addition, Hedy's autobiography was published in May 1999 by Unrast-Verlag, a German company. The book, titled Erinnern ist nicht genug: Autobiographie von Hedy Epstein ("Remembering Is Not Enough: The Autobiography of Hedy Epstein"), is available in German. The book, written by Hedy, covers her entire life and her experiences. It's ISBN is 3-928300-86-5. Hedy is also a contributor to several current & forthcoming books. Hedy has received many awards. Among the most recent ones are the 2005 Imagine Life "Education through Media Award" and the 2008 American Friends Service Committee's "Inspiration for Hope Award."